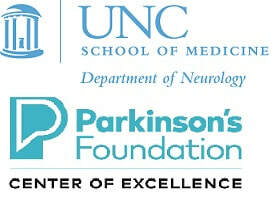 Parkinson's Foundation Center of Excellence at the University of North Carolina at Chapel Hill. In 2008, Dr. Nina Browner came to UNC as the Director of the Movement Disorders Center, a Parkinson's Foundation Center of Excellence. Having recently moved to North Carolina, she took it upon herself to reach out to support groups throughout the state, learning about local resources and sharing information on both Parkinson's disease (PD) as well as our Center's services. Upon hiring former Center Coordinator, Lindsay Prizer, in 2010, our Center decided to initiate on-site interdisciplinary services as well as create a network of specialized care for PD patients across the state. We began by creating a specialty Interdisciplinary Parkinson's disease Clinic onsite at UNC Hospitals. With PD-experts from neurology (Dr. Browner), clinical social work (Ms. Prizer and now Ms. Shurer), physical therapy, occupational therapy, and speech language pathology, our team offers patients a comprehensive half-day consultative assessments followed by a detailed plan of care designed by the interdisciplinary team. In 2011, we partnered with Rex Hospital Outpatient Rehabilitation to provide access to interdisciplinary team care for patients in and around Raleigh. Realizing that many of our patients live outside of our nearby service areas, we created a referral network of care by compiling information on allied health clinicians throughout the state who have been trained in Parkinson's disease. Many clinicians received training directly from the Parkinson's Foundation, when their Allied Team Training program (ATTP) was brought to Chapel Hill in 2011 or at other ATTPs offered throughout the country every year. Many more clinicians have received training in the Lee Silverman Voice Therapies for speech therapists (LSVT Loud) and physical & occupational therapists (LSVT Big), or in Parkinson's Wellness Recovery: Exercise4BrainChange. Our ParkNC referral network provides listings of the agencies throughout North Carolina who employ physical, occupational and/or speech therapists who have been trained in these programs and can provide evidence-based and specialized care to our North Carolina Parkinson's population. Our current Center Coordinator, Jessica Shurer, hired in 2012, has expanded these services by: increasing the number of professionals on the UNC interdisciplinary PD team, offering UNC-hosted trainings ("Colloquiums on Interdisciplinary Care for Parkinson's") on PD in areas of needs in NC, partnering with agencies to increase the number of PD-specific exercise classes and other resources offered, as well as helping to launch Moving Day NC Triangle, a walk for Parkinson's, in order to bring more financial support to Parkinson's programs in the state. All of these efforts combined make up our ParkNC program. We've made changes within UNC, connected community resources throughout the state, and made the referral network available to the PD community through our clinic and through this website. We want to ensure that PD patients throughout North Carolina are receiving the best, most specialized care available and have access to such care and other supportive resources. We greatly encourage allied health clinicians to continue to seek training from these outstanding programs and to send us your agency's contact information for our statewide referral network.